I will be totally, absolutely honest with you here. I wasn’t really expecting to like Mary Robinette Kowal‘s Shades of Milk and Honey [Amazon | B&N | Mysterious Galaxy]. …at which point I devoured the story, finishing the book in three days, and sacrificing a bit of sleep in the process. …an intimate portrait of Jane Ellsworth, a woman ahead of her time in a world where the manipulation of glamour is considered an essential skill for a lady of quality. But despite the prevalence of magic in everyday life, other aspects of Dorchester’s society are not that different: Jane and her sister Melody’s lives still revolve around vying for the attentions of eligible men. Jane resists this fate, and rightly so: while her skill with glamour is remarkable, it is her sister who is fair of face, and therefore wins the lion’s share of the attention. At the ripe old age of twenty-eight, Jane has resigned herself to being invisible forever. But when her family’s honor is threatened, she finds that she must push her skills to the limit in order to set things right—and, in the process, accidentally wanders into a love story of her own. There are a few action-type scenes toward the end, but for the most part, this is a relatively quiet book. And I loved it. I loved the characters. I loved the relationships between them, and the way Jane’s insecurities crashed into those of her sister, and the conflicts that ensued. I loved the language, which was careful and formal without ever feeling stilted or stuffy. The magic was particularly enjoyable. In a genre that includes Gandalf and Dumbledore, the glamours of Kowal’s world are relatively limited in scope: the manipulation of light and sound to craft illusions. It’s seen as a lady’s skill, like painting watercolors or playing a musical instrument. But Jane is very skilled and passionate about her art, and it draws you in until a scene about crafting an illusory birch grove is as thrilling as any battle between heroes and goblins. Certain elements and twists in the story felt a little predictable, but I wasn’t reading for the plot twists. I was reading for the sheer enjoyment. And I was kicking myself for not reading it sooner. You can read the first two chapters at Kowal’s website, and I strongly encourage you to do so. PC Monsters of Genre: Collect Them All! A week or two back, someone started a Twitter account called SFWA Fascists, dedicated to attacking the “screeching feminist witches” who are destroying the natural order — not to mention RUINING science fiction and fantasy — in the name of their twisted PC ideology. DL Thurston has a copy of the list here. Interestingly enough, people on the SFWA Fascist Enemies List reported suddenly gaining new followers, some as many as 50 to 100 in a few days. I started with myself, to celebrate my inclusion on the list. As of today, I’ve done cards for 7 of the 16 list members. I’m splitting my Hugo Novella reading into two parts, on account of novellas are long, so it’s taking me more time to get through them. Kiss me Twice, by Mary Robinette Kowal – Reading this story made me think of Asimov’s Robot Detective books with Elijah Bailey and his robot partner R. Daneel Olivaw. Both present interesting mysteries. Both explore the relationship between human and artificial intelligence. Both question the implications and possibilities of artificial life, the rules and the loopholes. I liked the Asimov books, but I like Kowal’s story even better. Much of this is due to the character of Metta, the police department’s A.I. I love how Kowal developed this character, the way Metta adopts a different persona for every police officer (much as a human might change clothes depending on the situation), the Mae West quotes she uses to joke with Huang, the way she’s simultaneously supercompetent and aware in the way only a computer can be, but also vulnerable and, if you’ll forgive the conceit, human. Detective Huang is a good protagonist, too. A decent, determined, well-developed character who treats Metta more like a partner than a machine, which means he’s invested on all levels when something happens to her. 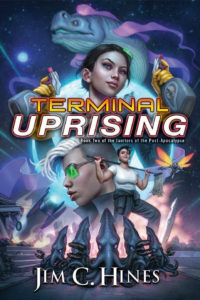 This is a fun, well-paced story which asks interesting questions, presents various nifty and shiny SFnal ideas, and made me blow off several things I needed to get done so I could find out how it ended. I’ve told Mary that 1) she should turn this into a book and 2) I want to write a blurb for that book. Silently and Very Fast, by Catherynne Valente – I’ll be honest, Valente’s skill with language and imagery made me question whether I was a good enough writer to review this one. (I decided to do it anyway!) This is a wonderfully layered story. It’s retold fairy tales and romance and tragedy and poetry and the power of story/myth and post-singularity science fiction all woven together. Like Kowal’s story, “Silently and Very Fast” deals in part with the relationship between humans and artificial intelligence. Elefsis is a program who started as the virtual keeper of a house, but grew into so much more thanks to the love and attention of a child, Ceno. It’s a relationship that can’t be forced into human terms. Ceno is Elefsis’ parent and lover and sibling and so much more. Thanks to the neural hardware, they’re literally a part of one another. Over the years we see Elefsis grow and pass from one family member to another as the humans age and die. We learn how the world has evolved during this time, and the lengths they’ve gone to in order to protect Elefsis. There were parts I didn’t understand at first. Only as I kept reading did some of those earlier scenes and stories slip so beautifully into place. I strongly recommend reading this one twice, because the parts become that much more gorgeous and powerful once you’ve seen the whole. Countdown ($2.99), by Mira Grant – “Countdown” is a prequel to Grant’s Newsflesh trilogy (including her Hugo-nominated novel Deadline). Having read the first two books of that trilogy, I enjoyed getting all of the background information on how the zombie uprising began, and seeing characters who until now had just been mentioned in a historical context. I think, if you’ve read and enjoyed the books, then this will be a good, powerful story, one you should definitely check out. The pacing and voice are similar to Grant’s other books, but the structure is different: “Countdown” is broken into lots of smaller segments from various characters’ perspectives as the inevitable undead uprising unfolds. If you haven’t read the books, I don’t know if this will work as well. (Or if you read the books but they weren’t to your liking.) Some of the power of the story comes from knowing what happens later on. For example, seeing the Masons as good, determined, loving people and knowing what’s about to happen and the kind of people it turns them into was simply tragic. On the other hand, much of it works just as well in isolation–like the stories and fates of those involved in creating the original viruses. Mira Grant/Seanan McGuire is up for four Hugos, but I think this one might be a long shot. While “Countdown” does stand alone, I think it will be more powerful and effective to fans of the books. Comments and discussion are very much welcome, as usual.